Architectural products are known for having some of the most challenging coating performance requirements in the industry. Coatings for building products need the right properties to withstand rain, humidity, salt air and UV exposure from sunlight while maintaining their original appearance during years of serving. 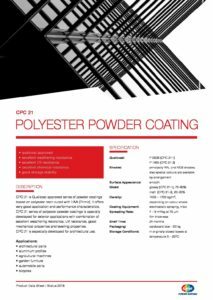 To ensure the quality of our products we provide Qualicoat-certified powder coatings, that hold the specification for architectural requirements.